High school physics teacher Michael Burstein looked a bit anxious as he sat at a long black-topped desk. The smudged chalkboard behind him was filled with kinematics equations. It's taking too long, he explained, for the human race to learn what planets look like. The planned mission to Saturn in 2007 seems too far off. And Pluto? His curiosity is growing. It's that inquisitiveness, some say, that has propelled the Harvard graduate's ascension in the world of science fiction, where writers pride themselves on tales of pristine Utopian societies, and darker outcomes of scientific advances as simple as the Internet and as complex as the government's abandoned superconducting supercollider. In just a few years, the former self-described wannabe writer who ditched plans to become a physicist, has published more than 20 articles, been nominated for two Hugo awards -- the equivalent of a Pulitzer Prize in science fiction -- and last year, won the prestigious John W. Campbell Award for best new writer. Still, Burstein's interest in science took a practical route; until, that is, he received a degree in physics from Harvard and headed to Boston University for a graduate degree in the field. It was there that he met his future wife, Nomi Pearlman, who introduced Burstein to the science-fiction subculture, alive with writing groups and science-fiction fan gatherings. ``Boskone,'' the New England Sci-Fi Association's annual convention in Framingham, draws up to 800 people. ``I was in graduate school buying books on how to write science fiction and reading story after story when I should have been working on my problem sets,'' Burstein jokes now. He received his degree, but took a job teaching science and math in New York, writing on the side. In 1995, Analog Science Fiction and Fact -- one of the top-selling science-fiction magazines -- agreed to publish his short story, ``TelaAbsense.'' 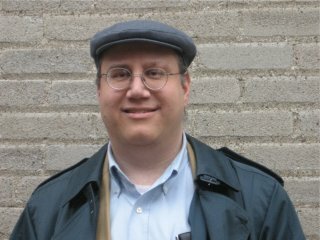 It was Burstein's first published piece and it would go on to win a 1996 nomination for the Hugo Award, given each year by the World Science Fiction Society. In ``TelaAbsence,'' Tony, a boy who lives in a city, sneaks into a wired, futuristic private school because funding to build such advanced schools in poor areas falls through. In the school, students wire in from all over. Textbooks automatically adjust to students' reading level. But in order to join in, Tony must steal virtual reality glasses from another student. Burstein got the idea for the story after he heard a comment that by 2001, everyone would have electronic mail. Stanley Schmidt, editor of Analog, which publishes only 1 percent of submissions, said Burstein has a talent for quickly ``seeing ideas in lots of places.'' One idea, for instance, came out of a lunch appointment Burstein had with Schmidt. Schmidt led his guest down a New York City street to an Argentine restaurant he liked, but because the editor's memory of the restaurant's location was one block off, the two men spent several minutes walking up and down the street in vain. Burstein later wrote a story about a similarly disappearing cafe. In his story, Daniel is killed when the tunnel does just that. The explosion leads to the discovery of another universe in which everyone has a double. So in ``Absent Friends,'' a sequel to ``Broken Symmetry,'' published in the September edition of Analog, Jack heads to the other universe to try to find Daniel. A woman Jack meets, however, tells him that her father had died, and that the best way to handle Daniel's death is to move on with his life. Burstein's father, a New York Daily News copy editor, suffered a heart attack while picking up his check at union offices during the paper's 1990 strike. ``Jack's friend convinces him he needs to take control of his life and I could relate to that because my father died when I was a senior in college,'' Burstein said. However sweet his success, Burstein has no plans to leave the Cambridge School, where he began teaching in 1995. Instead he is bringing his craft to school, teaching a science-fiction course and even stopping class to jot down the ideas that his students' fresh minds often inspire. After he failed to win a Hugo the first time, students presented him with their own made-up award: The Cambridge School of Weston Bug-eyed Critter Award for Best Short Story. Anyone who tries to guess where Burstein's writing will go next might be stumped. One minute he talks about general relativity equations; the next about a fictional sorceress who can open a portal with a tango. ``No one ever said that writing science fiction has to be dull,'' he said. Copyright 1998 Globe Newspaper Company and may not be republished without permission.